What makes the Seed Theme special? It’s our new foundation theme — a framework for all future theme releases and updates from Organic Themes. Extra care has been taken to make sure Seed is a solid foundation for any WordPress theme project. The theme features all the goodies of our previous themes — a responsive framework, retina optimized design, font icons, shortcodes, WooCommerce and Gravity Forms compatibility and much more. It boasts a simple layout that was designed to feel familiar, functional and easily customizable. In addition, the Seed Theme is well documented and coded with an easily understood file structure. 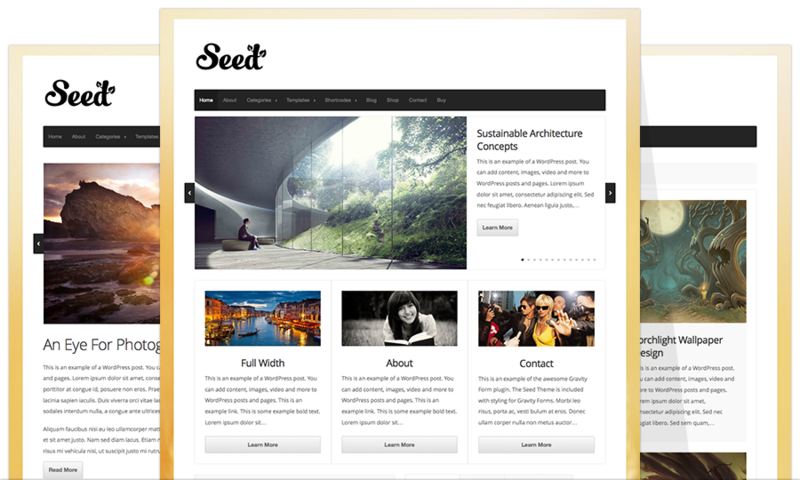 Seed has everything you need in a great WordPress theme and nothing you don’t. Seed makes for an excellent website solution out-of-the-box, but it was designed and developed with customization in mind. It’s built to be torn apart — for looking under the hood and learning what makes a WordPress theme tick. Seed is a perfect addition to any web developers arsenal of tools. I’ve been working with this theme and it’s great foundation for future themes! Yes! Finally someone writes about follow. You will still be supporting older themes…Right? Great theme, will you be able to sell at a cheaper price? What is this theme support for amp? May I simply just say what a relief to uncover someone that really understands what they’re discussing on the internet.